The fact that I’m not hungover is quickly replaced by the urgency to get the bags in order. After seventy days we’re leaving Thailand. Thailand’s been a great place to visit. It’s by far the most organized and modern country of the ones we’ve visited so far. We had hoped for better local food though. There’s a few dishes that’s really good, but a lot of what we’ve been served is oily and pretty flat. That makes us roll back onto more western food, but they don’t really do that all that well either. The hotel here has been a pleasure to stay at. Helpfully staff and a nice room. Very good indeed. We get help to print out the tickets we ordered yesterday that will show we have plans of exiting Vietnam within the fifteen days we’ll get with visa on arrival. All should be good then. We’ve pre-ordered a taxi to take us to the airport. Taxi. Not tuk-tuk, taxi. Tuk-tuk it is then. We cram bags and us in the back seat and it’s barely the driver get the old horse moving. This happens every time he has to stop for a red light or for giving way. I think he’s happy we’re off now. At the check in the lady asks us for our visa papers to Vietnam. We try to explain that we’re eligible for visa on arrival, but that doesn’t fly. After another senior attendant arrives they figure it’s Vietnam airlines problem. We’re flying Thai airways to Bangkok, will have to take luggage and check in again for the next two flights there. 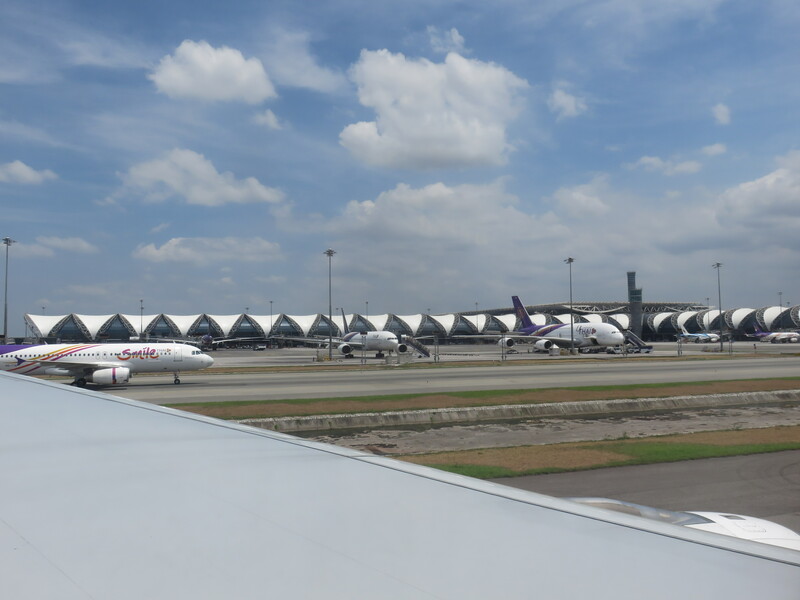 Domestic first, ergo no problem for Thai airways versus our visa. Nothing much to report from the first flight. It’s smooth flying, bag retrieval and re-check. We go by the post office in the terminal and send back the sign we picked up yesterday. Good to get that out of the way. Immigration is a breeze, so is security. Why is the security lines at home so insanely long while airports like this, where over fifty million passengers go through every year, lines are almost non-existent? Go figure. Two stop overs is boring, but we watch movies on our iPads and relax. The total flight time today is less than the wait at our first stop here in Bangkok. Nothing to do about it, so it don’t help stressing. Boarding, flying, next stop. Ho Chi Minh city. Visa on arrival by what must be the most grumpy man on border patrol in South East Asia today. Claim bags again, get to that next terminal for domestic flights, check in again, security control again, and then finally a sit down for a cup of coffee. Since the wait is counted in hours and not minutes it’s OK to spend time on this. It breaks up the wait and when we sit down it’s just an hour left to next take off. Flying in over Ho Chi Minh. What we’ve forgotten since last visit to Vietnam is they know nothing about coffee. Madam Family can vouch for that (a real inside joke). But we drink it nonetheless and try to get into the new exchange rate we’ll have to follow for the next fortnight. A nice surprise waited when we got onboard. We were given emergency exit seats on this last leg. Whee! There’s not many people onboard so there’s basics free seating, but hey! Emergency exit, baby! 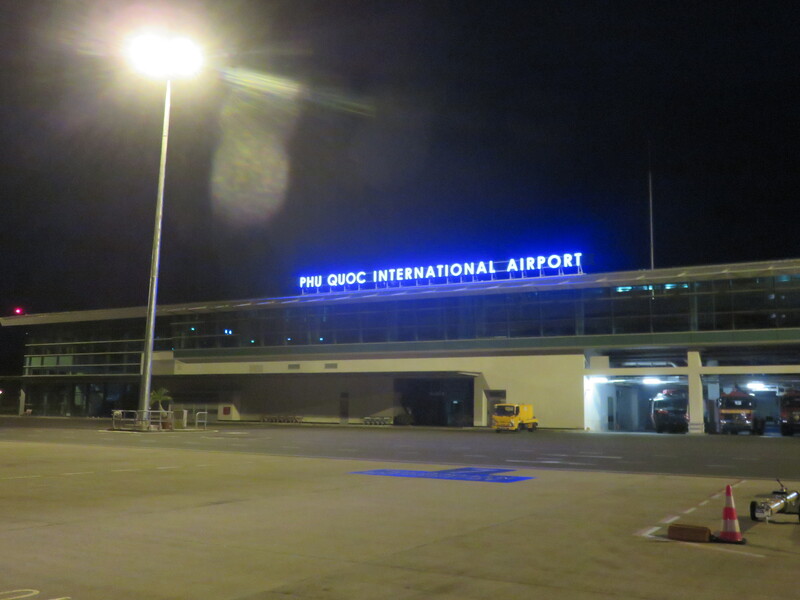 The airport on Puh Quoc is small so baggage retrieval is done in a flash. Outside there are two people waiting for us with a sign from the hotel. The man is muscle and driver. Sum, the woman, is there to greet and meet us. She’s very good in English and she explain about the island, the weather and the resort. The check in to resorts like this is so fancy I’m almost flabbergasted. I’m more of a down to earth guy with hamburgers before fois gras, and beer before wine. We get treated to four different cold teas, a cold towel and are greeted by the resort manager. The room we’ve booked is on the third floor to give us sea view. It’s to late and too dark to see the sea, but we hear it when we open that balcony doors. This is high class, and worthy of our anniversary. Katja have informed the hotel in advance about our anniversary and ordered pink champagne on ice. In addition to that the hotel has put out a special cake for us. We sit on the balcony in thirty degrees with the sound of the ocean and wind while sipping champagne and eating cake. Good thing we’re only celebrating our wedding anniversary rather rarely. When we go down to dinner we run into the resort manager, Jeevan, again and he takes us on a tour of the place. It’s a very good gym here, a big spa, free mountain bikes to borrow and a garden with passion fruit trees growing side by side with mangos and bananas. We continue our pampering at dinner and walk by the beach on the way back to our room. The sea is rough as it closes on rainy season and the manager told us we should be used to swimming in rough sea if we want to swim in the ocean. We’ll check it out again tomorrow. Now we’ll just enjoy the night in a big bed with soft linen. DUH! Beer before wine any day!